On a daily basis, Israeli security and intelligence agencies deploy a wide range of means to thwart mass-casualty terrorism plots hatching in the West Bank, Gaza, and other near-by areas. Bordered by Hamas, Islamic Jihad, Hizballah, and ISIS (which is present on two of Israel's borders - the Egyptian and Syrian borders), Israel is located deep in the hornet's nest of global terrorist activities. On most days, the Israeli home front functions without incident, and this is only possible due to the behind-the-scene, 24-7 efforts by security forces to thwart attacks. To this end, Israel uses a range of electro-optic sensors, deploys wide-ranging signals intelligence, scours the internet and other forms of communications and allegedly places informants within terror organizations. This can be achieved through counter-terrorism raids and arrests (for domestic security), or by launching guided missile strikes (for operations outside of borders), or through disrupting financial terror funding networks. Sophisticated cyber-attacks can also be deployed. 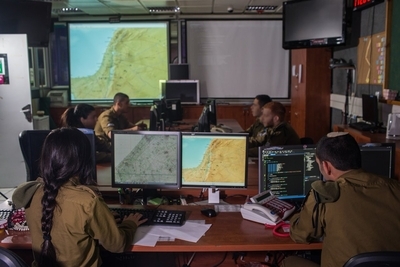 Israeli defense companies are at the heart of these ongoing efforts, developing technologies that enable security forces often to stay one step ahead of those plotting mass murder and destruction. Today, Europe also faces a jihadist menace. Left unchecked, the threat posed by ISIS could transform European societies from open, liberal entities to besieged nations, whose reality in the early 21st century could become unrecognizable compared to the Western European experience in the previous century. The recognition of this fact is now leading European states to knock on Israel's door and seek solutions, such as those described above. On Monday, a French police official and his partner were brutally murdered in their Paris area home by a lone terrorist who was driven by ISIS's jihadist ideology. It was the latest in a string of growing jihadist attacks afflicting Western Europe - attacks that have already caused European governments and security agencies to realize they need to rapidly adjust and catch up to the threat in their midst. The State of Israel faces significantly more severe terrorism threats due to its location in the heart of the Middle East, the ongoing conflict with Palestinian terror organizations, and due to it posing a central target for the radical Iranian-Hizballah axis. Yet Israel has built up decades of experience in preventing, monitoring and detecting, and countering attacks. European security planners, whose budgets have increased along with the rising terror threat, have begun forming 'shopping lists' of solutions. "I am seeing a rise in interest from Europe," Rani Kril, executive vice president, for international marketing at Elbit Systems, a leading Israeli defense company, said this month. It is driven by the new challenges of uncontrolled migration, terrorism, alongside the eruption of the Ukraine conflict and surging Russian-NATO tensions. He reported receiving many inquiries from European domestic security agencies, intelligence agencies, and militaries. "We know how to provide them with solutions," Kril said. "There is not a single country in Europe that has not increased its security budget." Additionally, he said, a growing number of European Union states are complying with the 'NATO pledge,' which obligates them to spend at least 2 percent of their GDP on defense. An increase in European military spending means they will be able to, if necessary, play a larger role in gathering intelligence or attacking ISIS targets in the Middle East, and attack the threat in its area of formation, rather than wait for the ISIS killers to move into European territory. This type of transnational counter-terrorism requires long-range intelligence-gathering capabilities and precision strike weapons, both of which are mass-produced by Israeli defense companies. Ben Baruch's agency is called SIBAT, which is the Hebrew acronym for the International Defense Corporation Directorate in the Defense Ministry. "We consider Europe an important goal for cooperation," Ben Baruch said. "The State of Israel, which since its establishment has faced security threats, is a unique laboratory for the development of solutions for defense and security that have proven themselves in the field," he added, in comments made before Israel set up a large pavilion at the Paris Eurosatory defense exhibition. "In recent years, in light of the unending series of terror attacks around the world, that have claimed thousands of lives and wounded tens of thousands, there has been a significant change in approach regarding defense and homeland security," Ben Baruch stated. "Israel's security industries offer advanced and proven solutions that provide a response to terror threats, as well as for the issues of mass migration and border protection across Europe. These solutions include real-time intelligence systems, automated systems for protection of large areas, defense systems, cybersecurity, and more," he added.